1RXS J0603.3+4214 (a.k.a. the Toothbrush) was discovered by van Weeren et al. 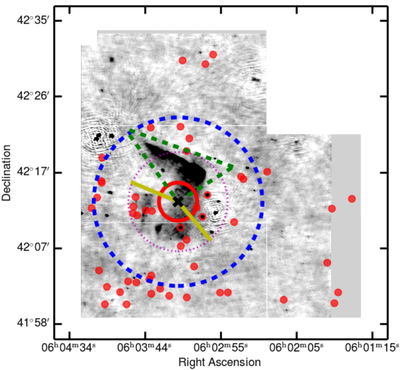 (2012) whose followup WSRT and GMRT radio observations enabled the identification of a relatively large (1.9 Mpc) and bright linear radio relic in the north, a connected and elongated ~2 Mpc radio halo, and two smaller and fainter radio relics to the east and southeast. The number of relics and elongated northern relic suggests that this is not a simple bimodal merger. van Weeren et al. (2012) measured a variable polarization fraction along the northern relic between 10 and 60%. They use the radio spectral index to estimate a Mach number of 3.3-4.6. van Weeren note that it is interesting that the the northern toothbrush relic and halo are connected by a region with a spectral index slope of alpha < -2, but then flattens to alpha ~ -1.2, and increases slightly towards the center of the halo. They note the possibility that the halo is actually a relic seen close to face-on. Perhaps indicating that previously accelerated electrons by the shock front are reaccelerated by merger induced turbulence. 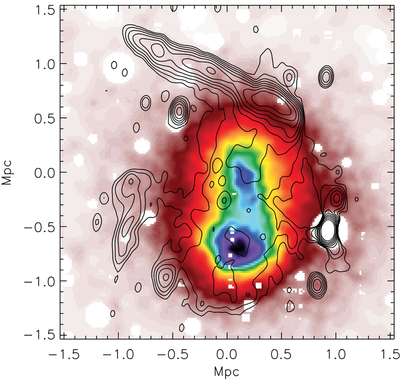 With five spectroscopic redshifts of cluster member they were able to estimate a cluster redshift of 0.225. Bruggen et al. (2012) performed hydrodynamical N-body simulations to try and replicate the elongated nature of the toothbrush relic. They found that they reproduce the relic morphology with a triple merger between two equal mass cluster merging along the north-south axis and by having third smaller merger in-falling in the south on a west-east trajectory. The third cluster then slingshots around and ends up in the northeast near the toothbrush handle. Ogrean et al. 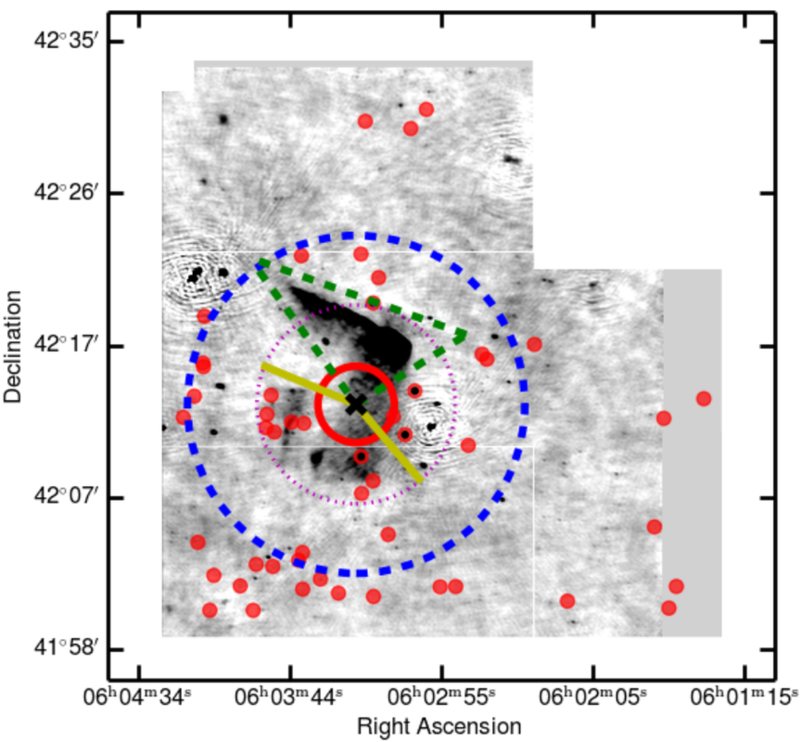 (2013) observed 1RXS J0603 with XMM-Newton and found X-ray gas shock density and temperature discontinuities at the locations of the three relics identified by van Weeren et al. (2012). However they only estimate a Mach number <2 for the northern shock (inconsistent with radio Mach number of 3.3 - 4.6) and they find that the X-ray shock is in part spatially offset from the radio emission in both distance and position angle, counter to the diffusive shock acceleration assumption that particle acceleration occurs at the shock. Ogrean et al. 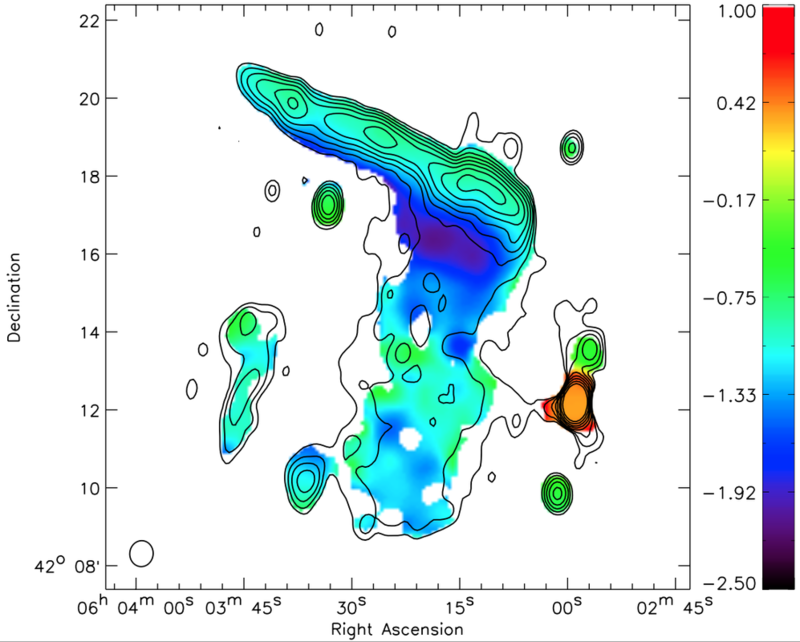 (2013) also note that it is strange that there is a density jump at the location of the eastern relic but no surface brightness jump. Stroe et al. (2013 & 2014) conduced a narrow band Halpa survey or the 1RXS J0603 field. Unlike CIZA J2242 they find no Halpha emitters near the northern shock, although there are a approximately 6 near the eastern relic. The luminosity of 1RXS J0603 is consistent with the low star formation rates of blank field galaxies at z = 0.2. They suggest that the difference between 1RXS J0603 and CIZA J2242 could be explained by 1RXS J0603 being in a more evolved state than the ~1 Gry old CIZA J2242 merger. van Weeren, R.J. et al., 2012. The “toothbrush-relic”: evidence for a coherent linear 2-Mpc scale shock wave in a massive merging galaxy cluster? Astronomy and Astrophysics, 546, p.A124. Brüggen, M., van Weeren, R.J. & Röttgering, H.J.A., 2012. Simulating the toothbrush: evidence for a triple merger of galaxy clusters. 425(1), pp.L76–L80. Available at: http://adsabs.harvard.edu/cgi-bin/bib_query?arXiv:1206.6118. Ogrean, G.A. et al., 2013. 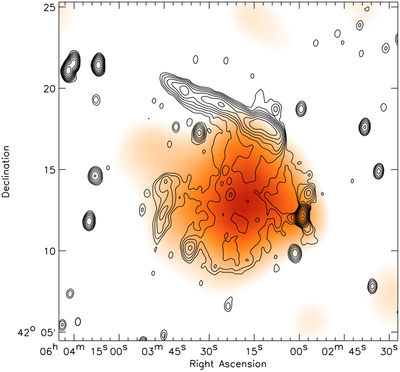 Challenges to our understanding of radio relics: X-ray observations of the Toothbrush cluster. Monthly Notices of the Royal Astronomical Society, 433(1), pp.812–824. Stroe, A. et al., 2013. 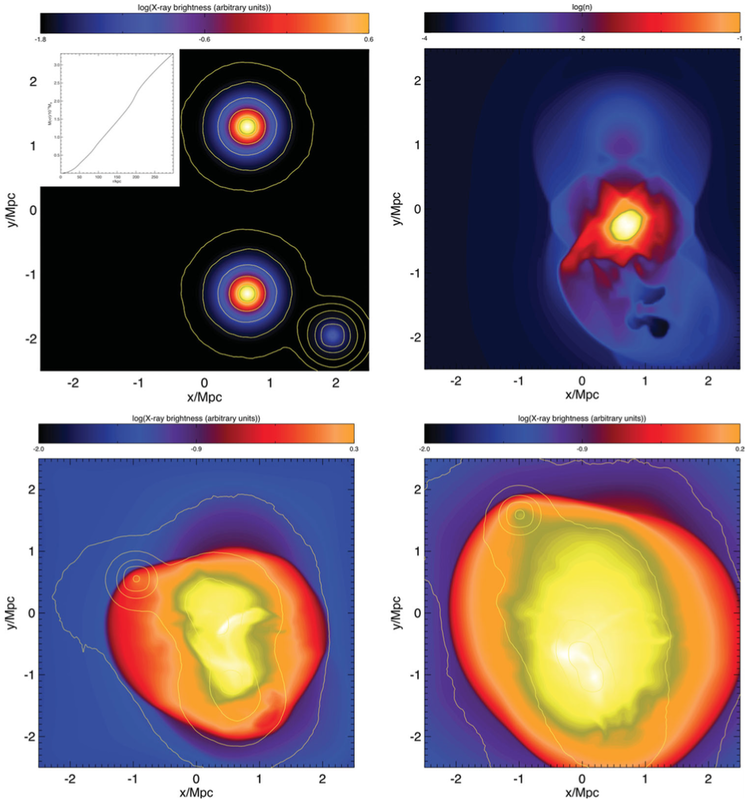 The role of cluster mergers and travelling shocks in shaping the H luminosity function at z 0.2: 'sausage' and “toothbrush” clusters. -1, p.2967. Stroe, A. et al., 2014. 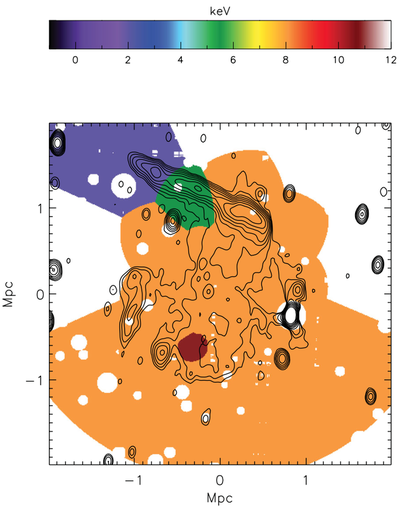 The rise and fall of star-formation in $\bf z\sim0.2$ merging galaxy clusters. eprint arXiv:1410.2891.